Over the past 15 years, I've been using relatively short Beverages, unterminated, at my home QTH in Oklahoma, USA. These low wires (average height about 6 to 8 feet) vary in length from 450 to 750 feet. I've found that such wires were useable directional antennas with very good lobes off of each end. For about four of those years, I operated a "half-wagon wheel" of Beverages of that general length with the wires running East, SE, South, SW and West from a central point in my back yard. At the time, I was primarily interested in SWBC DXing on the Tropical Bands (from 2.5 to 5.5 MHz.) and could use each antenna "directly," of course: for example, I could use the SE wire to look to my southeast for South America and for southern Africa. Happily, I could also use that SE antenna "over the shoulder" to look to my northwest along my Great Circle route to East and South Asia. In essence, by leaving the Beverages unterminated and thus bi-directional, I was operating quite nearly as if I had twice as many Beverages spread out in a full wagon wheel.  The signals coming "over the shoulder" from the normal backside of the antenna travel the length of the Beverage, going away from the receiver, hit the far end and are reflected back to the receiver. There is an inherent signal loss in this reflection and longer trip. Authorities and modeling programs differ slightly as to how much the "backside" signal is attenuated, but most tend to focus on 4 to 6 dB. Over the past year, my Northwest MW DXing buddies and I have become quite interested in reverting to "12 Volt DC DXing" from automobiles and campsites on the Pacific seashore. Our beloved Grayland Motel is for sale and we are anticipating the loss of that near-perfect layout, with antennas of optimum length running in the correct directions and terminated virtually in the surf at high tide. In the near future, we foresee many situations where we will be able to get our vehicles quite close to the shore, but where we will be so close that there simply is not room to run a Beverage out toward the sea. There are a number of familiar venues, however, where we could be DXing very near the shore itself and run antennas directly away from the beach inland through the scrub or forest laying behind the beach itself. Unterminated, we could then use these antennas to DX the far Pacific shore "over the shoulder."
. ideal for testing directional antennas. My automobile/DX shack was parked at the crest of a very gentle hill, with the antennas extended North and South from the vehicle, along the roadside tree line and suspended from the lower branches. The road runs absolutely North-South. The antennas were two new 500 foot Beverages. When laid side-by-side, one wire was about 3 feet longer than the other, but was not trimmed (the South antenna was the longer). The slope of the hill was equal in both directions and was such that the far end of each antenna was about ten feet lower that the automobile. The Beverages each went to one of a matched pair of new impedance transformers, then through identical 6' lengths of coax to an antenna switch and thence to an NRD-535 which was used to compare signal strengths on each antenna for a number of stations. The stations to be measured were selected to be spread across the MW dial and to be those laying directly to the North or South of my location. Each station that was measured put in a moderately strong signal, varying in strength from 1280-Arkansas City, KS which came in at around S-8 to 640-Norman, OK, which put in an S-9+10 dB signal. The tests were run at solar noon, with no thunderstorms present or audible on the band. The signals were exceptionally steady and were each the only signal audible on the channel. The signal strengths were measured twice, about 10 minutes apart and are (both) presented below in a relativist chart. 640 kHz Norman, OK equal, equal equal, equal Absolutely equal on both antennas! 1280 kHz Arkansas City, AR - - - +6 dB, +4 dB Again, the reverse! 1330 kHz Wichita, KS - - - +3 dB, +3 dB The reverse! 1580 kHz Blackwell, OK - - - +3 dB, +3 dB The reverse! NOTE: Two tests were also done to the side of the antennas: 1600 kHz., Cushing, OK to the due East came in about 3 dB better on the North antenna; 960-Enid OK, to the West-Northwest also came in better on the North antenna by about 2 or 3 dB. With the exception of the slope of the ground (DX shack at crest of gentle hill, each antenna sloping parallel to the ground downward about ten vertical feet over the 500 foot length) the two antennas were virtually identical, but running in opposite directions. Given that the signals were fairly equal on both antennas and that the measuring instrument (NRD 535 S-Meter) was fairly crude, precise results were not expected. In fact, the relative strength measurements of the stations to the SOUTH were about exactly what I expected: two of the three stations were stronger on the southerly antenna by 3 to 6 dB. The measurements of stations to the North, however, presented a real surprise: four (580, 1280, 1330 and 1580) were 3 to 6 dB stronger on the South Beverage that pointed away from them. This was so surprising to me that I exchanged the two lead-in + impedance transformer combinations prior to taking the second set of measurements. The results were identical except for a 3 dB drop in the 580 kHz. reading. One could still argue that, for some reason, the southern Beverage was just "working" better. That was my reason to measure the only two nearby signals that come in from nearly straight East and West. As you see from the note above, the two side signals were both received better on the North antenna! Just exactly why these anomalous readings came about could be the subject of endless speculation. Happily, that discussion is not at all relevant to the purpose of this particular field test. The goal was to determine whether the backside losses of relatively short Beverages were negligible or large enough to be significant when forced to DX "over the shoulder." Based on this comparison test, I feel comfortable using a short Beverage and DXing over my shoulder, when better, more classic arrangements are not possible. 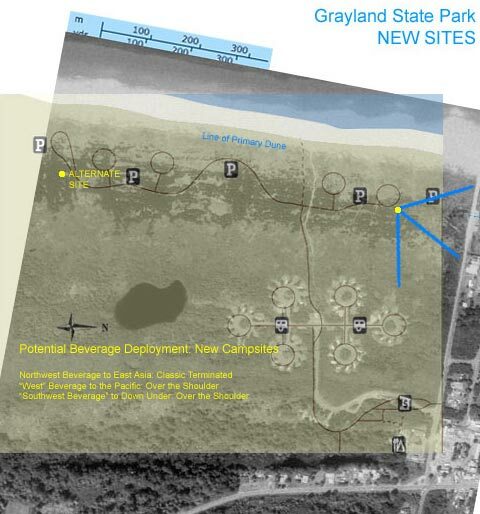 Above is a two-layer photo-montage of the new campsites now under construction at Grayland Beach State Park on the Pacific Coast on Washington State. Foot and vehicular traffic on the beach, even at night, prevents us from running antennas on the beach itself. As you may note from the montage, the new campsites are too close to the beach to allow us to deploy a full array of classic "direct" terminated Beverages from any single new campsite in the park. The array of blue lines at the upper-right of the montage indicate a deployment of the three beverage pattern that we find most effective for DXing from the Pacific Coast (NW, West, SW). Each antenna, as indicated is 500 feet long. The antenna running to the NNW is a classic terminated Beverage, the other two are "Over the Shoulder" unterminated affairs. Finally, some readers will surely ask why we do not simply adopt more compact beach-side antennas, such as the K9AY, Flag or KAZ large loops. We have done some rather careful comparisons between these antennas and our normal Grayland Beverage array and have repeatedly found that the Beverages were superior. This was true even when the same antenna comparisons had been judged "similar/equal" at inland locations. Additional comparisons will be made this summer and fall.